We'll be pleased to welcome your visit to our warm and comfortable offices. 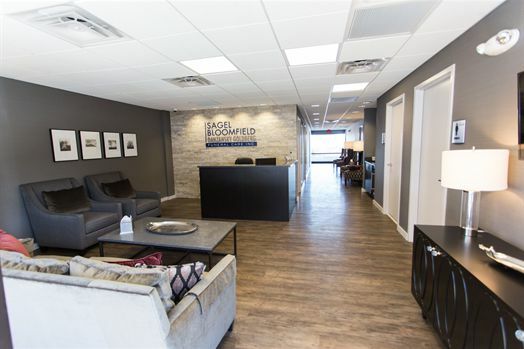 Sagel Bloomfield Danzansky Goldberg Funeral Care Inc was designed to be unlike any funeral home you've ever seen; it's truly a one-of-a-kind place. We invite you to come in and see for yourself how we're revolutionizing the way you think about funeral service. As of December 2015, we have moved and relocated to our new ultra-modern 6,500 square foot facility located in The Talbott Center on Rockville Pike. Located in Montgomery County, Maryland. Our new address is 1091 Rockville Pike, Rockville, MD 20852. To get there we are in the rear of the Talbott Center; Next to the Porsche/Audi dealership just off of Talbott street-come to the REAR of the center One block North of Woodmont Country Club on the same side of Rockville Pike Between Edmonston Drive and Twinbrook Parkway on Rockville Pike. Across the street from the former Danzansky-Goldberg location and Best Buy.